One of the biggest safety management challenges facing most workplaces comes from working at height. While fatalities from falls continue to be a major issue, deaths caused by falling objects at worksites add on to the problem for workplace health and safety professionals. Compared to a total of 275 people who died as a direct consequence of a fall from a height during 2003-2012 in Australia, accounting for around 11% of total fatalities, 227 people died in the same period as a consequence of being hit by a falling object, accounting for about 9% of total fatalities (Safe Work Australia). Additionally, drops and falls also represent a significant volume of general injuries. According to Australian Workers’ Compensation Statistics, 2012-13, published by Safe Work Australia, falls from a height represented over 7,400 workers compensation claims in 2012, with a median lost time of 7.2 weeks. Additionally, over 4,200 claims were recorded from injuries created by falling objects, with a median lost time of 4.2 weeks. Considering the high number of fatalities and injuries caused by falls and drops, it’s time for industry to focus on preventing or reducing these incidents by putting in place a mechanism for sufficient education, awareness and safety management systems. Workplace accidents take a heavy toll on both the worker’s health as well as the company’s productivity. Additionally, the injured worker’s family has to deal with the financial consequences arising out of loss of income and long-term medical expenses. Dropping various items from a height not only causes accidents but also exposes them to damage. When dropped over water, or into mud, machinery, down holes and other difficult-to-reach places, they are effectively a sunk cost needing replacement. Tools can be accidentally dropped in the course of working at height; however, the chances of dropped tools are vastly increased when environmental factors such as high wind, rain, greasy environments and even working with ill-fitting gloves come into play, making tool security an issue. These costs can be avoided for a comparatively low cost and a different attitude to containment. Gravity is commonly employed in various jobs to assist with quicker execution. For instance, a building demolition contractor may allow for materials to be dropped to a lower level using gravity instead of a controlled mechanical descent process such as a crane and debris bucket. Protective mesh or netting is also used to contain debris and prevent it from causing injury or escaping from the building envelope. However, gravity mechanisms or netting systems are less safe than alternatives because they rely on the principle of containment, rather than prevention of falls in the first place. Risk management utilising the principle of the Hierarchy of Control, is considered to be an excellent approach to preventing injury. The best practice for a company that has employees working at height would be to engineer a hazard out altogether or utilise alternative means of access to minimise fall risks. Using guarding or barriers to prevent the fall of people or tools would be the most appropriate means of protection possible as they completely eliminate the possibility of falling people or objects in the first place. 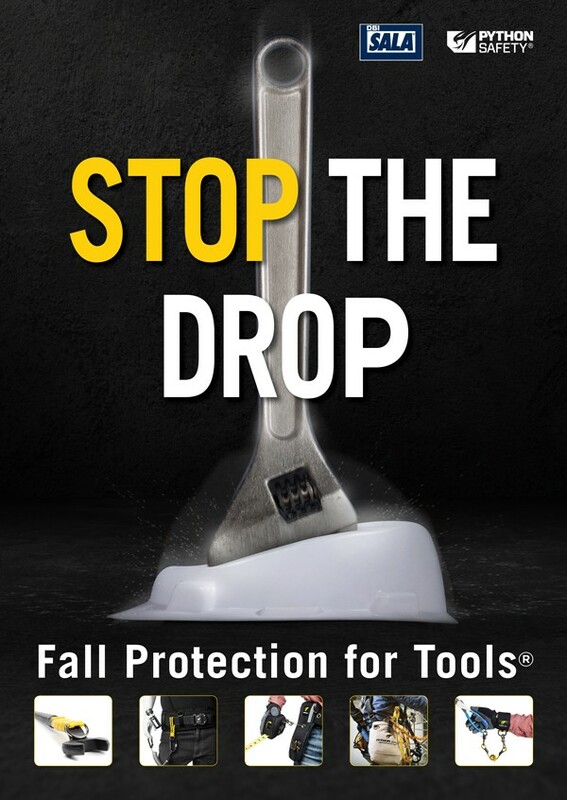 Fall protection equipment, including fall protection for tools and equipment, should be considered only when there are no alternative means of prevention. The use of fall protection equipment comes from the primary concern to protect the worker. Core components of a fall protection safety system include anchoring devices, full-body safety harnesses, fall arrest lanyards or self-retracting lifelines to connect between the two, and some defined rescue means to allow for safe descent. Fall protection equipment, in this context, reflects the company or contractor’s concern about the ‘primary consequence’ of a fall. However, a similar concern is not observed when it comes to the tools and equipment used for working at height. Dropping tools, for instance, can have secondary consequences on people working below, or innocent bystanders in the vicinity. Though small in size, nuts and bolts, spanners and other lightweight equipment assume dangerous impact forces once gravity comes into play. People don’t realise the impact forces that are generated in a dropped object. A 3kg item dropped 15m could create an impact force of over 500kg. A 1kg item dropped 50m will hit the ground at a little over 112km/h (excluding any air resistance). Even with some form of protection, the result of being struck by an item of relatively low weight can be significant. General personal protective equipment such as hard hats can be a good frontline barrier to reduce the impact of a dropped object if it is relatively light and not dropped from a very high location. However, hard hats are not so effective when they are exposed to falling bricks, rocks or other heavy items such as hand tools, or even drops from greater heights. Additionally, a hard hat is no protection for other parts of the body such as the shoulders and arms. In addition to the consequences of injury caused by a dropped tool or object, the company may have to bear the economic loss of equipment when it is dropped into the ocean, turbine or any machinery. Apart from retrieval costs, there may be financial consequences from having to repair damaged machinery. All these risks can be easily managed if a comprehensive safety management program for dropped objects is implemented. Educate the worker on the risks and outcomes of dropped objects and provide them with best practice solutions to minimise that risk. The prevention of ‘drops’ is not just the responsibility of the safety supervisor or the site owner, but of every person on the site. It is everyone’s responsibility to manage these risks because the consequences might affect co-workers, innocent bystanders and the company. About the Author: Michael Biddle is the Managing Director, Australia & New Zealand for 3M, and the current Chair, Working at Height Association of Australia.